The next day was our last day in Monterey. We made our way over to the Mission San Carlos de Borroméo de Río Carmelo (the Carmel Mission). There are 21 missions in California, and at some point I’m going to visit all 21 of them. Before this trip, I’ve been to four: Mission San Buenaventura (Ventura), Mission Santa Barbara (Santa Barbara), Mission San Francisco Solano (Sonoma), and Mission Santa Ines (Solvang); plus one in Tucson, Arizona – now I added a fifth to the list! The Carmel Mission was founded in 1770 – by Junípero Serra – the first site of the mission was in the town of Monterey. However, due to poor soil and some power struggles with the Presidio of Monterey, the mission was moved to its present location a year later. Junípero Serra founded nine of the 21 missions in California, with this one being the second (after San Diego). This was also his favorite – where he established his headquarters. The first church and dwellings were made of wood, with the adobe structures built later. The first years were hard and they relied on the Indians for supplies. But eventually, they had a steady supply of labor – although it is questionable whether their methods of getting the Indians to stick around were very humane. At the height of the mission, there were 927 Indians working and living at the mission. Junípero Serra came and went, founding other missions along the way, and baptizing and confirming Indians throughout the region (over 4,000 Indians were baptized at Carmel alone). Serra died at the age of 71 (that’s a long life as an adventurer out in the wilderness!) 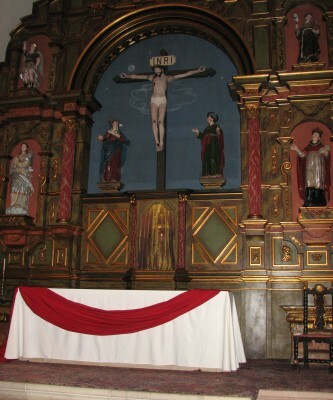 at the Carmel Mission and at his request, was buried beneath the main altar of the church. The present church was constructed in 1794 on the site of the original church (Serra is still buried in front of the altar). The curved walls were covered with a lime plaster made from burnt sea shells, and the floor was made from tile. The tower is a Moorish design and has nine bells. It is the only one of the California Missions that has its original bell tower dome. In 1834, the Indian population had dwindled, and the Mission was secularized, which means that it became a conventional parish church. The mission lands were transferred to Hispanic settlers and gradually the church fell into ruin. When the United States took control of California, they also took control of all of the missions, but the property was returned to the Catholic Church in 1859 – the church was already in ruins by this time. 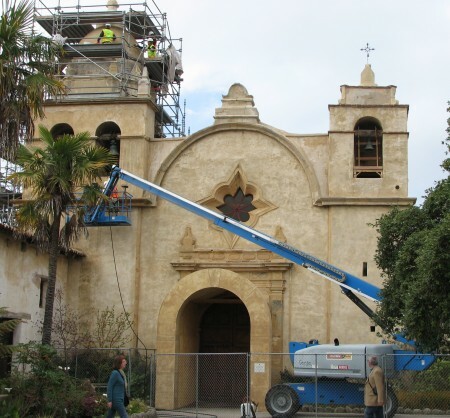 Restoration was begun in 1884, by putting a new roof on the Mission. Eventually restoration was completed and you have the grand structure you see today. 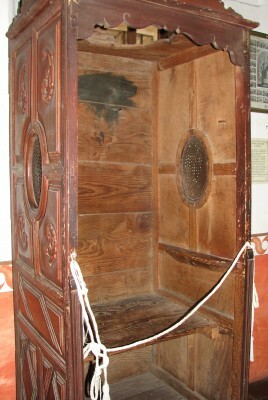 In 1987, Pope Jean Paul II visited the Mission San Carlos de Borroméo de Río Carmelo, and prayed inside the Church. In 1988 Serra was beatified by Jean Paul II. Beatification is the third of four steps in the canonization process, which is the process to sainthood. During the process, his treatment of the Indians was debated – at this point Serra has not gone through the last step to sainthood, but I have no idea if that is a result of his treatment of the Indians. The church today remains an active parish church with a school for children aged kindergarten to 8th grade. The interior of the church is beautiful, and we took a while to just take it all in. 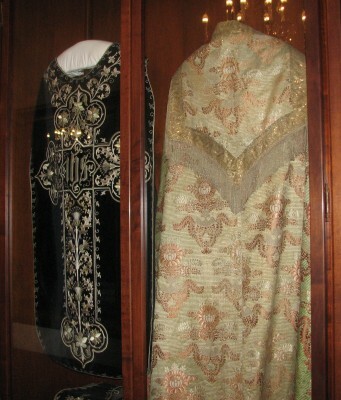 There is a display before you enter the church of the vestments that Serra wore during his lifetime; the garments are in amazing condition and the color and detail are vivid and intricate. 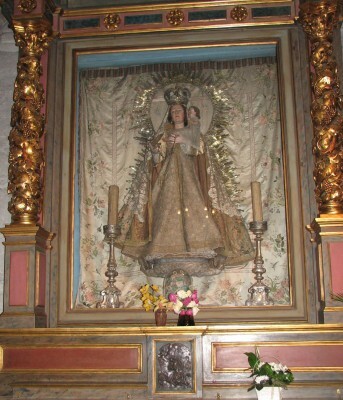 There is also an icon of the Virgin Mary in the church that is over 300 years old. The Mission also has a museum showing the rooms that the priests lived in, the mission library and the books it contained, and information about how life was lived on a mission property. It is a self-guided tour, so you can take as much time as you would like exploring the different rooms and exhibits. The mission is designated as a National Historic Landmark by the National Park Service, but the church is maintained entirely by private funds. It is well worth the visit to see a mission that is almost 250 years old!